A chocolate is a food made from roasted ground cacao beans. Chocolates differ from its varieties in concentration, milk used and maybe where it was made or came from. Toblerone has already evolved. When we were still a kid until now, we were always having that great smile when we receive the bar of Toblerone during Christmas or birthdays. The traditional bar of Toblerone has series of 12 peaks. Each triangle piece represents the Swiss Alps. Toblerone is named for both the inventor of the confection, Theodor Tobler and torrones, the honey and almond nougat found in the chocolate. Way back before, Toblerone was made by Suchard which was later swallowed by Kraft. 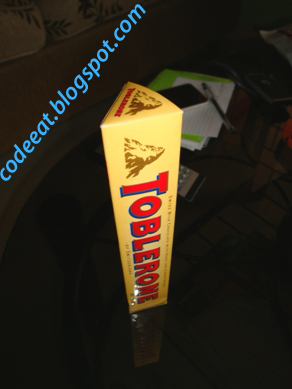 Toblerone chocolates nowadays are made by Kraft Foods Inc. The milk chocolate. Which is the most common of all chocolate variety. The Toblerone Dark introduced on 1969.
and lastly, the Toblerone Praline introduced on 1997. This is the only variety I’ve never seen in a bar. I’ve experienced this 5 varieties in a can. This can or box is called Quality Street which is distributed by the Nestle since 1936. The 5 varieties of Toblerone peak were individually wrapped in the can of Quality Street 70th Birthday Edition.